There’s a small town in East Texas called Carthage where, in 1996, a local funeral director murdered a widow and covered up her death for nine-months. However, the funeral director was so loved in the community that, even when he confessed to the crime, citizens petitioned for his release. This much is true. 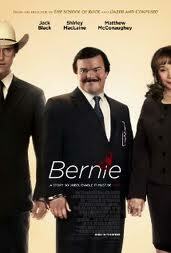 In the film, Bernie (the funeral director) is portrayed by the versatile Jack Black in a surprisingly understated performance. The character is quirky, but not unbelievably so, especially alongside the regular residents of the town. He’s joined by a handful of other actors including the marvelous Shirly MacLaine and Matthew McConaughey, with the rest of the townsfolk playing themselves. And this is where I think the film fell down in quite a major way. It’s like it isn’t quite sure of what it is – is it a fiction based on truth or is it a documentary with reenactments? If it is a documentary, then it is not clear that the reenactments are just that – it would seem to be presenting it all as fact. Having the townspeople who have been vox popped throughout the film within reenactment scenes is confusing. On the other hand, if it is a fiction, it really didn’t need to have such reliance on the interviews. I think it would have been fantastic either way, but as it is, it feels a bit like an amazing story that hasn’t been told as well as it could have. Jack Black was nominated for a Golden Globe for Best Actor in a Motion Picture – Comedy of Musical.